Peace to you, too. And I get that feeling sometimes: Just colour! Thank you! And when time is short at the end of the day……you can still make art, if you do it fast! Makes you feel better than maybe some other things might. Bonus! Love these bursts of color! Love the colors, Laura!! 💜💙💚❤️😃I agree…sometimes you need to to slap so color around. Hehe… But these are wonderful and would make an awesome pattern for pillows!! An eye of the hurricane pattern would be cool! Thanks so much, Charlie! I’m so glad you think so! I’ve been inspired too by what Cynthia is doing and playing with patterns is fun at the end of a day of concentration. Sometimes realism is great and just what I need, and sometimes I need a color break. It’s always nice that art can give me whatever it is I am looking for when the work day is over. So glad you enjoyed this! LOL, thank you, Sharon! Your order is on its way to sunny LV NV! Haha, have a super day Laura! The colors are super! You really gave those Neocolors a workout! Love the touch of black. Thanks, Carmel! I do find the black is key on these. Glad you like! Such exciting, vivid, happy color combinations, and I can almost feel the motion of these circles because of the color strokes you made. Very pretty! Thanks, Carol! I’m in love with those neos! Oh boy. I’m crazy about those. I want to do some. Beautiful color palette! I think it would make a lovely textile for a scarf or tote. Thanks so much, Deborah! It was so much fun to make! I’m so glad you like it! Thanks, Jean! You too, my friend! Wondrous creatures, whatever they may be! Lovely colours and intriguing shapes! 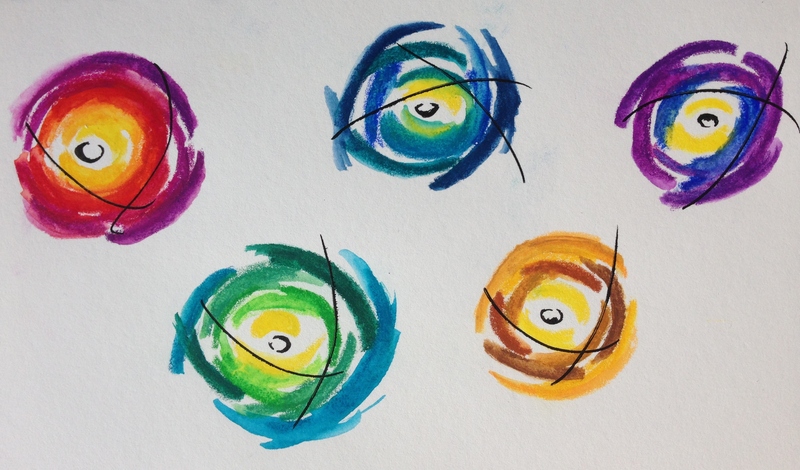 I see eyes, but I also see those colourful kids’ pinwheels, perhaps caught up in a hurricane and going a tad berserk! There’s a great sense of motion to them. Thanks, Jacob! Hm.. maybe that hurricane, berserk feeling is coming through the artist lol! 😀 They were so fun to do. I could get really hooked on circles, but I don’t wanna bore the heck out of everyone. they remind me of the centers of peacock feathers, very beautifully colored! Thanks so much, Lorie! If you ever feel like playing with art supplies, Neocolor II pastels are so much fun. They’re very similar to kids’ crayons but they’re water-soluble and very vibrant. And Fun! you’ve read my mind, i would love to give them a try! Awesome!!! I really hope you do! They are totally sunny and warm! ❤ Ahhhh, I feel better already basking in your art! joyful and summery – just lovely Laura! hmmm, you don’t see me when I’m tired and cranky at night. chuckling!!! Little jewels of art, great abstract design and such fun things to see…and do. Just going with the flow can lead to exciting discoveries. Thanks for sharing these gems. Peace. Thanks, Brianna! I think those neocolors make anyone who uses them look good. They are so easy and so vibrant and I feel like a kid with a crayon every time I use them. They’re just wonderful! I’m so glad you’re enjoying my color play. I enjoy your work too! It’s always fresh and interesting. It’s nice when we can inspire each other. Thanks for your feedback, Donna! Oh, those neos are so wonderful. They make art so fun and easy. I’m so glad you enjoyed them. I think February is a good time for color! Awesome! I’m sure she will. My daughter loves them too! They make art so effortless and fun! Neocolors are wonderful little pieces of heaven! 😀 So glad you like this!